Metallica just wrapped up a grueling two-year tour behind 2008's Death Magnetic, but in May they'll head back into the studio to begin a new project. "We want to record it in two weeks," guitarist Kirk Hammett tells Rolling Stone. "We had planned on doing it in March, but we pushed it back to May. I don't want to give too much away, but it's not really 100 percent a Metallica record. It's a recording project, let's put it that way. Without getting too deep into it, it's more a recording project than a bona fide Metallica album. Whether or not we can pull it off in just two weeks remains to be seen." "You've probably heard us all say it . . . the vibe was just so incredible at last year's Big 4 shows that we can't stop now!! 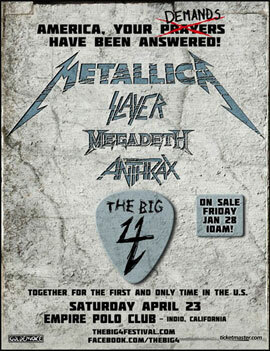 So we're finally bringing the love to our home turf on April 23, 2011 with 'Tallica, Slayer, Megadeth, and Anthrax in Indio, CA at the Empire Polo Club (yes, the more observant of you will note that this is the same spot where the Coachella Festival takes place the weekend before). It's true - this is indeed the only scheduled stop in America this go around, so we're hoping that you can head West to join us. Tickets go on sale this Friday, January 28 at 10 AM PST and Fan Club members can check MetClub.com for pre-sale and VIP package info. 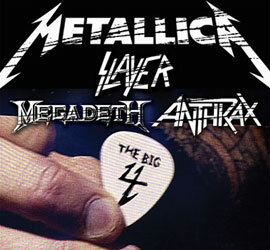 For more info about the show, including ticket pricing and transportation information, check out TheBig4Festival.com"